Before coming to Rojava, I often wondered who where those brave people who leave behind their comfortable everyday-life to defend the social revolution, putting their lives at risk in this armed struggle. I reckoned, from the stories and “martyrs” I heard about, that most of them were revolutionaries who had followed their ideals. Reality is, as most of the time, far more complex than what it looks like from afar. Let me tell you what I have observed up to now. There are basically two kinds of motivations among the international volunteers: on the one hand, there are people who are indeed convinced revolutionaries; on the other, there are those who fight Daesh (frequently, former soldiers) in order to defend “their country” or simply because they want to add a few lines to their CV for private military companies. Obviously these two categories do not reflect the complexity of each and every persons life course: Some of those who have come to fight against Daesh can develop sympathy for the revolution once they see what is going on here. That’s by the way what the YPG-comrades are hoping for: that the contact with revolutionary ideals and fighters can convince them or at least, make them gain some respect for the project of democratic confederalism. For convinced leftists as myself, this kind of thing clearly disturbed our need for revolutionary purity… especially when you have traveled several thousand miles to reconnect with the deeper meaning of the word “revolutionary”. So, what shall one think of such a compromise? First of all, a practical consideration: the international volunteers (and particularly former soldiers and marines, especially the Americans) give us some certainty (admittedly, a tiny one) that imperialist powers won’t abandon us too soon. For sure, if one or two leftists died from an Turkish attack, that’s one thing. But it’s another thing, and it involves a much bigger political cost, if several dozen former marines were killed after an air strike. I am not suggesting that our Kurdish comrades use us as human security shield. On the contrary, they put a lot of trust in us. Revolutionary or not, we are all heval (this means something between “friend” and “comrade”). Neither do we serve as cannon fodder, nor are we treated as valuable, little objects one needs to preserve. We can ask for the occupation that we would like to have, according to our skills of course. That’s the conclusions we have come to among revolutionaries. And the idea that due to the presence of our Chuck Norris trainees we might avoid that a Turkish F-16 drops a 500kg bomb above our heads makes the ex-marines quiet bearable ! It’s useful to remember the case of Spain in 1936, where thousands of volunteers joined the revolution and/or the international brigades. We frequently think of them as people motivated by revolutionary ideals. Again, reality reveals to be much more nuanced, as I could learn from my own family history and from studying the background of some of these volunteers. In fact, the big depression of 1933 and mass unemployment were important explanatory factors for the departure of many young workers to Spain. I digress, but this little historic excursion allows me to highlight two aspects. First of all, there is the weakness of the support that the revolutionary left gives to this large social movement, one of the most progressive in decades. I’m not talking about position statements or articles or meetings, but about effective and concrete solidarity initiatives. Secondly, what I will say now might be shocking but the revolution here won’t get forward or develop thanks to a few nice phrases, but with concrete acts of solidarity. 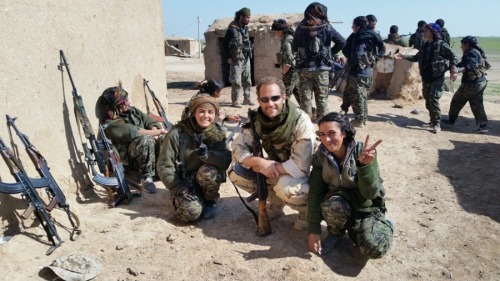 Let me tell you a bitter truth: The first international volunteers in Rojava weren’t revolutionaries, but former soldiers… their convictions might be the exact opposite to mine, but no matter how you put it, a concrete act stays a concrete act. Of course I would prefer that all of them were true revolutionaries but, by the end of the day, who’s the one helping most the social revolution: a former soldier who joined our ranks, or the activists that debate about the question if our revolution is a true one from behind their computer screens several thousand miles aways from us, and who in 15 years might have come to a conclusion if this fight was worth it or not? And, isn't the fact that non-political persons found their way to Rojava a proof that something important is going on here?